If you are reading up on the latest SUPER FOODS and health trends you have probably heard of Goji Berries. -Protects cells from premature aging through its powerful antioxidant action. -Higher in Vitamin C than oranges. What's in a Goji Berry? 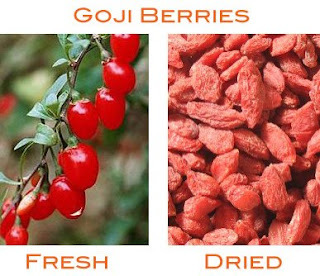 Goji Berries are a powerhouse of nutrition. The tiny red berries contain 18 of the 20 protein-building amino acids. They are also rich in complex polysaccharides, unique low-glycemic long-chain sugars which are currently being researched for their healing properties. When grown under ideal conditions, goji berries are rich in disease-preventing polyphenols and flavonoids and are over 20% fiber. They contain more vitamin C than oranges, more beta-carotene than carrots, more calcium than broccoli and more antioxidants than any other food." ..I promised a secret...here it is. A while back I bought Goji berry juice, after reading all the hype. I also bought some dried berries and even a weird super goji tonic. I tried them all...excited about adding a new superfood to my diet...and BLAH!!!! I wasn't impressed with the raw eat from the package or bottle products. Hmmm....what to do? Such a healthy berry must be eaten joyfully somehow! but softened goji berries are divine! It's like raw garlic compared to roasted garlic, much more mellow and palatable. When you rehydrate goji berries, they really become tastier. *Add to cream of wheat or oatmeal--as you would raisins. ...the taste is soft and mellow and sweet tart and yum. ....The tea suggestion is the easiest and it only takes a few seconds for the berries to soften up in hot tea. I love goji berries in my morning green tea. ps...for some reason Goji berries--warmed and softened taste GREAT with raw walnuts....a little oatmeal or cereal tip.